Marking type: White horizontal rectangular printed gallery label with typewriting in black faded ink adhered to old brown paper backing. Location: Stretcher top middle verso. Text: ‘PAINTINGS BY AMERICAN ARTISTS / [centered dark short separating line] / WILLIAM MACBETH / INCORPORATED / 450 FIFTH AVENUE NEW YORK / “Hearthstone” [blank underline] / by [blank underline] / Emil Carlsen, N. A. [blank underline]’. Marking type: Handwritting script in pencil. Text: ‘4 / [separating line] / above book ed?[?] / (right)’. 2017 Heritage Auctions, Inc. [1976- ], Dallas, TX, “American Art Signature Auction – Dallas #5330”, November 3. – Heritage Auctions, Inc. [1976- ], Dallas, TX, “American Art Signature Auction – Dallas #5330”, November 3, 2017, lot#69087, illustrated: color online. 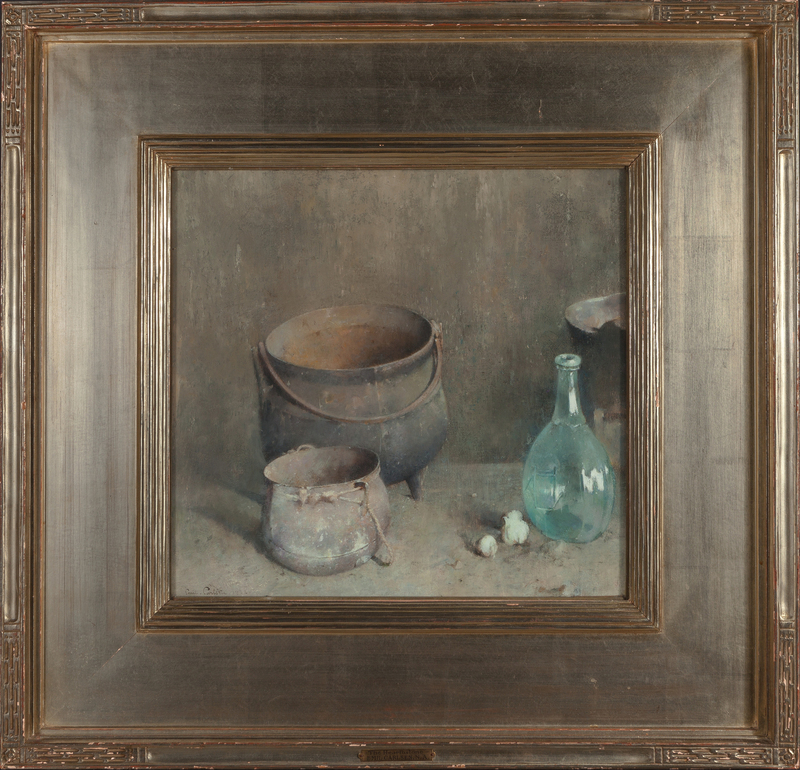 – Macbeth Gallery, New York, NY, exhibition catalog, “Paintings by Emil Carlsen, Theodore Robsinson, J. Alden Weir“, October 30, 1923 – November 19, 1923, #5, not illustrated. 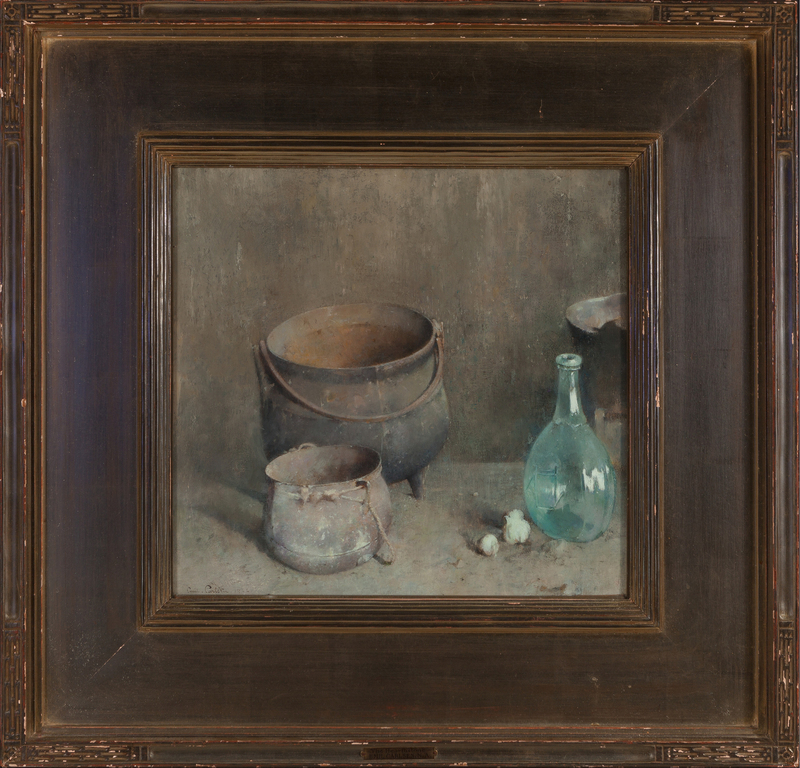 – The Corcoran Gallery of Art, Washington, DC, Exhibition Catalog, “The painting of Emil Carlsen“, April 3-29, 1923, #17, not illustrated. – The Macbeth Gallery, New York, NY, Exhibition Catalog, “Recent paintings by Emil Carlsen“, March 6-26, 1923, #10, illustrated: b&w. – Still life with glass bottle, 1926. – The blue vase, ca.1923. 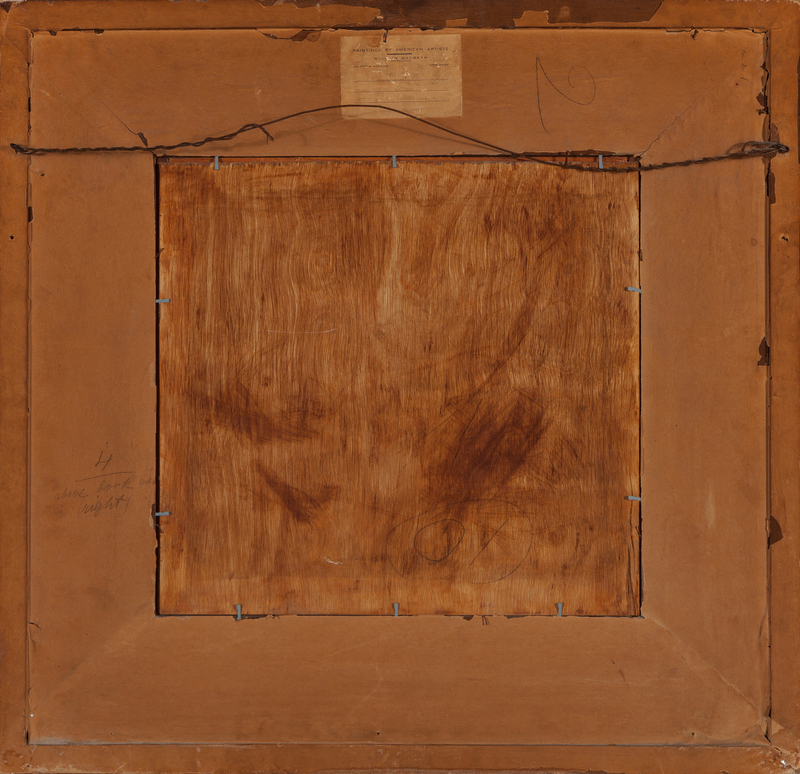 – Condition Report: Minor craquelure and surface grime with light frame wear; under UV light, there appears to be no inpaint; framed under glass.